Off-page optimization in SEO is the technique which can improve the quality of your website by refining and marketing the content of your website or blog and helps to upgrade the level of business. 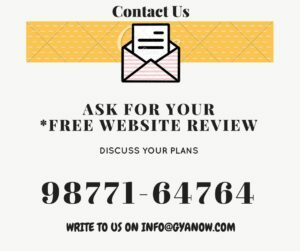 Moreover, Gyanow InfoTech offers best Off Page Optimization services in Jalandhar that makes the website more effective. By upgrading the ranking on Google search result page which in the end attracts the clients towards your company, product or services offered by you. Rank or position of the company website is the first thing that hit on the mind of every person who wishes to deal with that company, it is essential that the company present virtually on the first page of the searches. The website should be fully optimized and easily accessible to make it on the top, as well as the content provided in it should be of high value and serves the requirements of the targeted audience. There are certain techniques like Social networking, search engine submissions, local citations, blog marketing, image sharing, classified submission, document sharing, social bookmarking etc., are included in SEO off page optimization. Social networking also called ‘Online Business Reputation Management‘ is an easy approach to advertise your business in friendly and trusted way. It establishes the reputation of the company by offering best of its clients. Photo sharing and video sharing are something interesting to do as everyone loves to capture and share the precious moments of their life. These are interactive techniques to promote business sites. Blog marketing is writing articles for your own blog in particular topic (Niche Writing) and taking reviews about data you added to others sites, which fascinates the online user towards your website when they post a comment on it. Publishing your articles on article submission sites and takes the attention of the client in the direction of your website or blog. You may also promote your site by participating in answering the questions posted by others on sites like Quora, Yahoo Answers etc. If you do not spam any data then this is the best way to increase the popularity of your profile. By submitting your products or services to the local citation and classified sites helps to increase the likelihood of people finding the brand and product that you are selling. On listing your website to Google My Business and maps will reach you to the target number of viewers and drive a decent amount of traffic to your website. Content is also the major tool to improve the ranking in Google search results. Rich content with targeted keywords is sufficient to make the website in visitor’s eyes. The descriptive and informative content attracts more readers to your webpage and blog. This also leads to the decrease the bounce rate of your website. The above-mentioned methods promote the website which is called SEO Off-page optimization and helps to build your reputation online. All the above off page tasks are considered under backlink (inbound links) and are used to make quality backlinks. Gyanow Infotech provides top quality backlinks from domain authority websites that are required to boost your ranking on search engines. Nowadays we provide quality off page optimization services in India that is must for your site or a blog. Currently, we are proving our best off page services in Jalandhar, Punjab, India and all over the world.